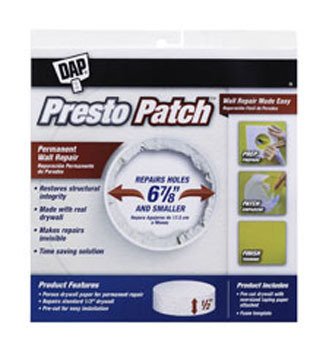 Paint Store :: Shop by Brand :: DAP :: DAP 09157 PRESTO PATCH DRYWALL REPAIR SIZE:1/2" X 6-7/8" PACK:12 PCS. DAP Presto Patch is a simple, structural and invisible solution for permanently repairing holes in drywall. This product repairs up to 6 7/8" holes in standard 1/2" drywall. DAP Presto Patch includes a pre-cut drywall circle with oversized taping paper attached and a foam template. WOOSTER 4153 ULTRA PRO LINDBECK SIZE:3" PACK:6 PCS.